In this post, I’m going to share a strategy that has helped me become more productive, and keeps me motivated week after week to continue my work. You’ve almost certainly heard of the 80/20 Principle (or Pareto Principle) before; the concept that 80% of your results are coming from just 20% of your actions. What I’m about to share is a formula that picks up where the 80/20 Principle leaves off. Similar to many entrepreneurs, I’ve been a huge fan of 80/20 for years, and I also attribute much of my success to its use. It is quite rewarding to find that vital 20% and put more of your focus there. As powerful as that concept is, there always seemed to be something missing.. While it shows you what you should be focusing on, it does leave something important out. Motivation. As important as it is to work on the 20% of your business that is crucial to your success, I’ve found it equally important that you stay motivated to continue on. What good does it do you to focus on the 20%, if the results from that work will take months or years to be seen? Not much. It was this realization that helped me begin to develop this formula. But what exactly needed to be allocated, and at what percentages? After much trial and error, I’ve settled into a split of 65%, 25%, and 10%. This is how I divide my working hours. Check out this infographic for an overview, and I’ll explain it in detail below.. I usually refer to this block of time as my short term focus. Spending nearly two-thirds of my time on the actions that will yield results within a month’s time seems to be the sweet spot. This allows me to hit a few milestones each month, which really helps with maintaining focus & consistency with my work schedule. This block helps keep you looking ahead, rather than just whatever happens to be right in front of you. It also helps build up the habit of delayed gratification. While it is important to focus on the short and medium term time frames, it is also good to look a bit further out. This 10% is for time frames that range from 90 Days to 1 Year. This smaller piece gives enough focus on the longer term without sacrificing the here and now. This can also be seen as your ‘speculative’ time block. Things often change drastically in a year’s time, so putting too much focus on an objective too far out there can be detrimental. This is especially true if the situation changes before you get there. What I’ve experienced since allocating my time this way has been nothing short of life-altering. In the past, I would jump around from a mostly short-term focus to a mostly long-term focus, and everything in between. This led to inconsistencies in when I would achieve results and hit milestones. A short-term focus meant that I was achieving lots of results, but they weren’t actually moving me forward very much. A long-term focus meant that I was ultimately moving forward, but not able to stay motivated long enough to reach my objectives. It’s easy to stay focused & motivated when you have something to show for your efforts; small wins & milestones being hit week after week, month after month. Implementing the 65-25-10 formula has brought my life back into balance. I’ve also found several other areas of my life where this ‘action allocation’ model can be used. 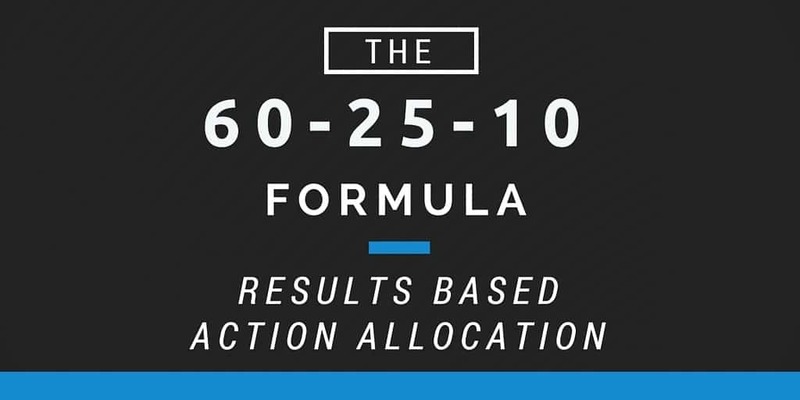 In the same way that the 80/20 Principle can be applied to different areas of you life and work, The 65-25-10 Formula has multiple applications. There has been a lot of value received from applying this formula to my different income sources. Currently, 65% of my focus is on Active Income, 25% is on Passive Income, and 10% is focused on what I call “Experimental Income”. The Active Income is pretty straight-forward. Anything that I need to do “on-demand” is active income. This could be any freelance work, or any other work that needs my direct input & involvement. For Passive Income, the focus is on anything that can be created once, and sold more than once with little involvement after its creation. This is mostly Kindle books & email courses at the moment. The Experimental category is for my more speculative ventures. Maybe I’ll end up getting paid for my efforts, and maybe not. It also usually has a much longer time horizon for receiving any benefits. Since the likelihood of a payoff is slim, it’s vital I limit this slice to 10%. The majority of my investing is for growth. For me, these are ‘hand’s on’ investments that I have direct control over, and have near complete influence on the outcome. Mainly buying low, adding value, and then selling high; all done with a short-term turn around. My second largest category is the ‘safer’ investments. These are slightly more passive, without as much of a ‘hand’s on’ approach. The main focus here is guaranteed returns, backed by hard assets. Speculation is simply that, speculation. These are long shots – high risk & high reward. I expect to fail 9 out of 10 times, with that 10th time covering the losses of the other 9, while still bringing in a nice return. These investments are complex & creative, and are full of excitement. Another area I’ve been testing this formula on is for individual projects. Not all projects move in a strictly linear manner, so for those that don’t, it’s a good formula to experiment with it. For me, the 65% portion is typically the part of the project that takes the most time, or is the most straightforward. The 25% is for the parts that have waiting time, or have some back & forth between with a 3rd party. They are more deadline driven. Lastly, the 10% section is usually the finalizing of the project & tying all the loose ends up. It’s different for each individual project, but it’s been helpful looking in projects this way..
It’s also a good idea to have balance in life; work, growth, and recreation are all important, and life can begin to lose meaning if time isn’t being spent in one or more of these categories. For most people, their work takes up the biggest portion of their time. I’ve been fortunate to have found a way to make a good living without sacrificing personal growth & recreation, but it’s still been important for me to spend some time in each category. I currently spend more time with Growth than Recreation, but it could just as easily be the other way around. If you find yourself frustrated, depressed, or feeling a little ‘off’, it’s a good sign that Work has edged out at least one of the other two categories. I’m still tweaking this formula the more I put it into practice, but just think of it as a guide. The main theme here is that almost everything we do can be broken down into smaller parts, and those parts can be sorted. By being aware of this, we can plan our actions and execute them better, leading to more effective results. I encourage you to take a look at the way you spend your waking hours. What areas do you find yourself excelling at? Which ones need work? Pick an area that could use some improvement, and then look at the way you’re currently allocating your actions. Often, a small shift can lead to a huge improvement over time.